Force Reaction offers a meeting between mellow but creative musicality and a classically interesting approach to rap. The leading voice throughout this album has something of an accessible, guy next door kind of tone – almost like a poetic or spoken word outpouring put to music. The lyrics are where the strengths lie, and this is why it works to have a relatable vocal at the forefront – you want to listen, it doesn’t demand attention, it just impresses with ideas and wordplay among a series of charming, colourful musical backdrops. Call Me kicks things off with character and subtle intensity. The lyricism is dense and you quickly adjust to the approach and to this spacious, almost minimalist soundscape that fuses trip hop with some elements of electronic rock. Organic High follows and adds a little swagger and light funk to the process. The vocals rise in passion throughout, again working well to captivate and to contrast with the rhythmic calm of the ambiance. Out of My Element follows in a manner that suggests there’s a definite underlying concept to this whole album. The stories seem to connect with one another, like the scenes in a movie or the pages in a book. The soundscape here is dark and mysterious at first, later breaking away to become hopeful and acoustic – unexpectedly melodic. It’s a totally characterful, unpredictable track that represents its own ideas well. Big Pharma afterwards pushes with more musical intensity and a manic kind of backdrop. The piano, the tripped up beat, and the dashes of distortion all support this relentless, unstoppable vocal outpouring. The artist barely takes a breath during this experience. The song’s hook is as short as ever but strangely comes with a slightly Bowie-like aura. The song itself is increasingly angry and deals with the title’s implied concept by means of an unapologetic outburst. Asylum Dreams (Fight) changes direction and deals with mental health – a spoken word introduction makes for a welcomed moment of calm and provides a caring warning as to what lies within. Force Reaction holds nothing back, ever. You’re promised realness and this album encapsulates that from a lyrical perspective. Dignified afterwards presents a smooth and stylish bass-line and attempts to start a discussion that involves audiences far and wide – something we undoubtedly need more of these days. The music feels a little retro but you learn to enjoy and embrace this as the Force Reaction creative drive. Rise Up follows and feels musically similar but showcases rising intensity again and encourages a sense of togetherness or revolution. It feels like a rock track on occasion, not an unusual thing on this album. Genre means a lot less these days as artists express more freely and utilize whatever they must in order to build the right soundscape. Stigma deals further with the concept of mental illness – it’s a personal song but it includes the wider audience again, as is the way with this whole album; it feels far more like something for everyone, rather than a personal account. Never Satisfied follows and is as spacious as can be. Creative yet now familiar, the music supports a seemingly free-flowing, stream of consciousness from the artist. Things come to a close with Aside – a track that quietly requests your attention and affection with an epic-feeling intro but a subsequent, contrasting level of space that gets you hook on the vocal flow. Again, there’s no pause – no moment to breathe. This forced reaction, as it were, is clearly something that had to be made – as implied by the name. The album encapsulates the issues of today, politically and socially, and it does so in a passionate and original, recognisable way. Equal and Opposite is, it turns out, the perfect name for this project. Force Reaction is a collaboration between Silus Bedlam (vocals) and Bitter Sweetness (production). Download or stream the album here or via Bandcamp. 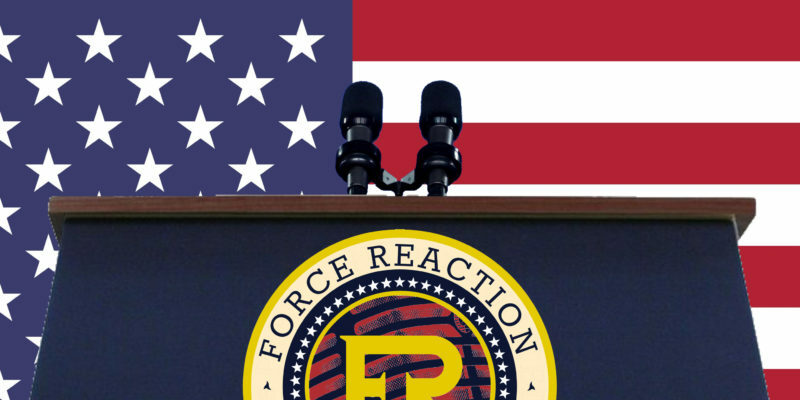 Find & follow Force Reaction on Facebook, Twitter & Instagram.